I love this kichen. It was one of my inspirational pictures when we did our kitchen. Love the counter tops, lights , and stools. The chalkboard is pretty with the white frame. God, you always post the BEST inspiration pics! Love! I'm in the mood to make a great vinaigrette. I think the secret is that I generally don't like mustard, but it's so imperative in a dressing. Must get over this and my fear. Yes, I wish that was my gorgeous kitchen! High ceilings are wonderful. Your recipe sounds delish and similar to one that I enjoy. Home-made is better by far. Happy weekend Tessa! Like Julie, I don't like mustard, but maybe this does not taste mustardy? I should have mentioned this, but I PROMISE you will not taste the mustard in this recipe. Try using only a tsp and the brand I use, just make sure it is not the grainy kind of dijon. I've made this for mustard haters and when they requested the recipe they didn't believe me. :) You have to give it a try. The kitchen is lovely. Thanks for this recipe. I love anything lemon. Have a great weekend! 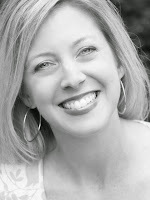 new to your blog and happy to meet you! i will definitely stopping by more often! 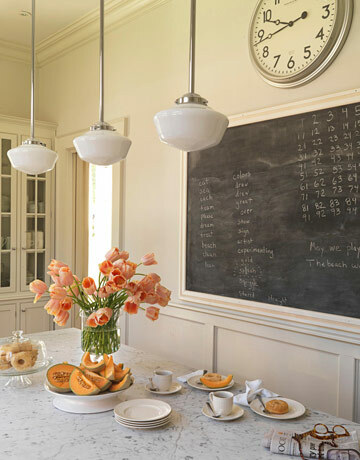 Can I just say that one thing I like about this kitchen (and a doable thing) is the combination of the cantaloupe and those peach colored tulips? Brilliant.